Hello, my name is Susanne and I am the School Principal at Maltalingua. I have been working with Maltalingua since 2015 but can already see that it is different from the other schools across the Island. Originally from the U.K. and a career in banking, I decided to move to the sun and change my life completely. I moved to Malta in 2001 and started a new career in the EFL industry, where I developed a passion for teaching which still continues today. In my free time, I enjoy walking, travelling and music. I look forward to welcoming you to Maltalingua. Hi. My name's Michael and I'm the Director of Studies here. I joined Maltalingua in December 2017 and I am really enjoying meeting the students and seeing their progress in English. Before I came to Malta, I taught in the UK, Bulgaria, Italy, Poland, and Vietnam. I love being able to help people achieve their dreams - whether it's to travel around the world, to attend university in English speaking countries, or whatever it is that they want to do with English. In my free time, I like reading books, playing football, and doing yoga. I look forward to meeting you here at the school! Hello, my name is Tania and I am the Assistant Director of Studies here at Maltalingua. I joined Maltalingua in February 2018 and it’s been a great experience! The team is incredibly friendly and professional, and the students are lovely. You can find me at reception during break time to answer any questions about your course and experience here at Maltalingua. I am Portuguese, but I’ve lived in different countries, namely Portugal, England, Malta and Mozambique, and I can speak English, Portuguese and Spanish. I have been working in the Education sector for 10 years and I have experience in both teaching and academic management. I really enjoy my job and live by the motto ‘Find something you love to do and you’ll never have to work a day in your life.’ I am looking forward to meeting you here at Maltalingua! Hi, my name is Julian Micallef and I am the Student Welfare Officer at Maltalingua Language School. My main role at the school is that of the wellbeing of our students, which means my job is to be there to answer and assist you as well as I can. My responsibilities include running the leisure programme for our adult students and managing of our student apartments. I am Maltese and love this little island. Being Maltese gives me the advantage of knowing what to offer our students, whether it is historical sites, day trips to Gozo or the best parties on the island! I graduated in Hospitality and Tourism Management and over the past seven years, I have gained invaluable experience working in tourism and various other language schools. I'm a very active person and am always on the go, which also helps me in my line of work. I love sports and keeping fit. I practise cross lifting and find that pushing yourself in any sport is not only good for you but beneficial in maintaining a strong self-discipline attitude towards life. 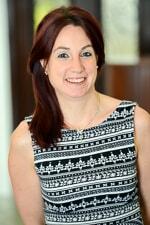 My name is Aoife and I am the Junior Programme Manager here at Maltalingua. I am from Ireland but moved to sunny Malta in 2018. I am enjoying all that Malta has to offer, from its beautiful waters, to the local history and everything in between! I have been working in the industry for over 3 years now. The school is a great place for students to learn in a great environment, I have been able to meet new people from all over the world, and learn different cultures along the way. I am an active, outgoing person, I enjoy running, strength training and dancing I also I love to travel and cook. I am looking forward to meeting you and showing you Malta’s sunny islands! Hello, my name is Karen and I’m the Head Registrar here. I started working for Maltalingua in May 2018 and I can say that it is a great working and learning environment. I truly enjoy being part of the team. I have experience working in schools and universities in Italy, Turkey, Malaysia and now Malta. Even though I haven’t been in this country very long, it is already evident to me that this is a great little island with a lot of character. I’m definitely in the right place as in my free time I love going to different beaches and spending time in the sun. I’m also into reading and I’m always interested in learning different languages. I can't wait to meet you all! Hello, everyone, my name is Evelyn and I've been working as a student registrar for Maltalingua since 2013. I am from the northern part of Italy, close to the Austrian border. I grew up in a bilingual environment, which has been a big advantage for my career. I’ve worked and lived in Italy, Dublin and now in Malta. I’ve been working in tourism for almost 20 years, mostly in the hotel industry. I still always enjoy taking care of the correspondences and bookings of our students. I like the mix of nationalities and the friendly, family atmosphere of our school very much. I love how Malta has so much to offer: amazing beaches, mild weather, and historical sights. I’m Jesika and I have been working at Maltalingua since November 2017. I’m Czech so I am responsible for the Czech/Slovak and Spanish market as well because I speak Spanish too. I studied at Salamanca and lived in Spain for a while. I have achieved a bachelor’s degree in International Relations – British and American studies. In my free time, I love to go to the gym, run or to do any kind of sport. I love to cook and travel. I miss eating tapas in Spain! I like to work at Maltalingua because I have very nice colleagues who have become my friends. I have met a lot of people from different countries at Maltalingua and I am happy when I help make their dreams come true to come to study English in Malta with us. I looking forward to meeting all of you! Hi. My name is Olga. I have been working as a student registrar at Maltalingua since 2018. I am Russian, originally from Kazakhstan. I spent several years living in England, moved to Malta 3 years ago and now enjoy life under the sun. I have been working in the education industry for many years. I really like working with people, communicating and helping people achieve their goals.